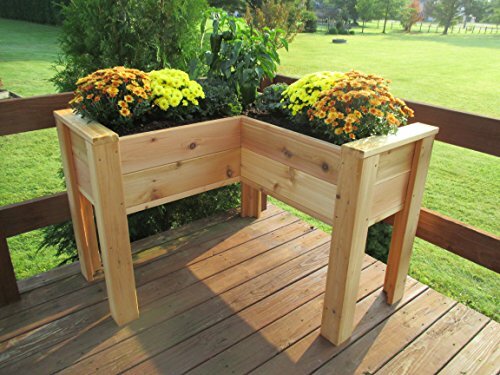 Made from naturally rot resistant premium quality cedar deck boards , these L-shaped elevated planter boxes are the perfect size to frame a corner or enclose an area on a patio. This planter has deep soil beds so you can grow anything from herbs and flowers to deep-rooted vegetables and perennial shrubs. The convenient L-shape provides easy access to your plants and wheelchair, save space and the comfortable 32" working height keeps produce away from slugs and animals/pets. This stylish planter is easy to assemble and very durable, made in Maine USA from the same 100% natural rot-resistant cedar as our popular line of raised beds. If you have any questions about this product by Infinite Cedar, contact us by completing and submitting the form below. If you are looking for a specif part number, please include it with your message.